We’ve all been guilty of it from time to time, and I can admit that I have. Just as we don’t really want to drop our weight down (that’s called vanity folks, but really, don’t worry what others in the gym think, focus on you). In some instances, you have no choice. And pregnancy is one of those. So if you’re pregnant and in the gym: don’t reach for your max, or worry that you’re going to get looked at funny for doing a lighter weight. Remember, you’re growing a baby and you don’t want to do anything to harm him or her. It’s about their well being for the next 9-months. … And back on track… An “eyeball” workout routine is when you walk into the gym, stand there and take in your surroundings. Free weights, bands, balls, machines, etc. You mentally perform each exercise in your head briefly, putting together a new combination that will accomplish what you want to do that day. Basically: You walk into the gym and wing it. No pre-planned exercise, no program. Just go for it. On the other days, I do yoga at home and when it’s nice, I’ve hit the water and done some kayaking. **Tip for pregnant women: If you’re experiencing balance issues, use a seat or a bench for the raises and flyes. 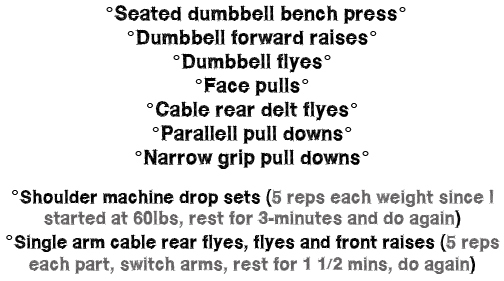 The face pulls can be done on a ball or even a bench if you need to grab one too. Be mindful of the weights you use, your posturing (and support), and remember to breathe through each rep of each set! And remember, it’s all about maintaining right now, you’re not in competition mode, She-Woman mode, or any of that business right now. Staying fit and healthy, but keeping baby healthy is key and priority. **Everyone else: When doing drop sets, or multiple part sets, be mindful of that weight you’re choosing. With drop sets, sometimes you can go a little heavier than you would for a normal set, but still be careful. If you find that on that first round, that heaviest weight was a little too much, ratchet it back a smidge for the next round. Same with multiple part sets. If you do one rep and know that you won’t be able to follow through, executing the exercise PROPERLY for the remaining sets and parts, then don’t do it. Pick a different weight that you can execute the exercise with.